Hello lovelies and welcome to March! Isn't it a lovely thought that we've firmly put February behind us and spring is quickly approaching? Hallelujah! I completed that new little sundress on Saturday. Instead of getting the light blue chambray that I was originally planning, I fell in love with a super cute print. The dress was easy and turned out so great that I'm going to make another in a different color. I'll be posting pictures of it later today - so, stay tuned! My eight year old, faithful brown clogs are trashed. So, I ordered these from my favorite online shoe store. They were a little pricey, but if you average out over 8 years... I can rationalize any pair of shoes. Can't wait to get them. They'll be my new, comfy go-to shoes. So that's what I did this weekend (other than the laundry, groceries, etc.). What's going on this week? I'll be working away in the studio to produce new spring things for the shop and working on this with the beautiful turquoise paint we've decided on - can't wait to finish that project, too. Also, my son will be coming in for spring break and I can't wait to see him. Later this week, I'll have a surprise - a giveaway - my first in several monthes! So, stay tuned for that info. March is here...YAY! 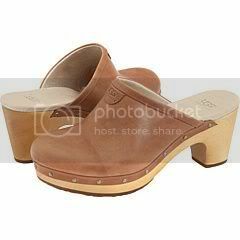 I can't believe clogs are back. I'm totes going to have to pick up a pair myself. Chanel did a fab job at making them a lust item pour moi. I'm gearing up for a month long in-laws visit today! Can't wait to see the dress! I haven't sewed clothes for me forever! I am so, so, so, so happy it's finally March!! What a nasty winter it's been. I'm ready for spring! I'm so jealous of your ability to sew! I can replace buttons and fix small tears (lots of those with two boys - right now I have 2 sweatshirts, a pair of jeans, and a jacket waiting to be repaired! ), but that's about the extent of my sewing abilities. In fact, I'm taking the jeans and the jacket to the tailor! Congratulations on finishing the taxes - doesn't it feel great! I still have to file our DE taxes but that takes about 15 minutes online. Our federal refund is already in our checking account - woohoo! I can't wait to wear flip flops. I am glad it's March and it'll be Spring soon!